The ablation of atrial fibrillation (AF) is an area of intense research in cardiac electrophysiology. In this review, we discuss the development of catheter-based interventions for AF ablation. We outline the pathophysiologic and anatomic bases for ablative lesion sets and the evolution of various catheter designs for the delivery of radiofrequency (RF), cryothermal, and other ablative energy sources. The strengths and weaknesses of various specialized RF catheters and alternative energy systems are delineated, with respect to efficacy and patient safety. Correspondence to: Boaz Avitall, M.D, Ph.D, The University of Illinois at Chicago, Department of Medicine, Section of Cardiology, 840 South Wood Street (M/C 715) Chicago, Illinois 60612. With a variety of intracardiac catheters and energy sources, growing research suggests that a minimally invasive approach can be applied to treat AF successfully. Among these energy sources are radiofrequency, cryoenergy, laser, microwave and ultrasound. 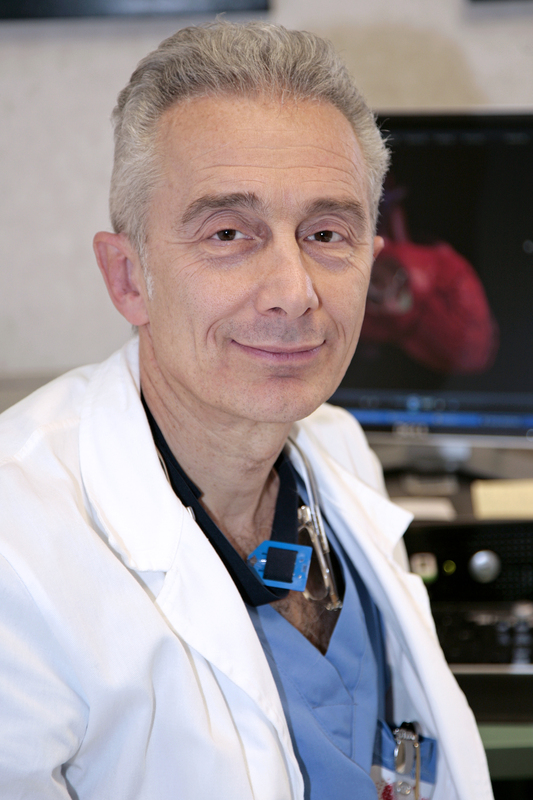 At the present time, radiofrequency energy is the most widely used energy source, and various specialized centers have achieved high success rates in treating arrhythmias with catheter ablation techniques using conventional radiofrequency energy. However, catheter ablation procedures remain technically challenging and operator-dependent, and centers that have less experience have lower success and higher complication rates. Therefore, further developments of catheter ablation technology are still required to improve procedural success and longterm outcomes and to reduce complication rates. The desirable characteristics of an efficient energy source for catheter ablation should include: (a) ability to form uniform linear lesions; (b) adequate depth for transmural ablation, (c) freedom from contact dependence, (d) short procedure time, (e) lower risk of endocardial disruption/perforation and thrombosis formation, and (f) no injury to extracardiac structures. In this review article we focus on the potential role of energy sources and catheter design for catheter-based treatment of AF. It is now well established that in a subset of patients with paroxysmal AF, one or several foci, which initiate premature atrial contractions (PACs) or recurrent runs of atrial tachycardia (AT), result in the initiation of paroxysmal AF. The most intriguing aspect of this arrhythmia is that the foci are often identified to be within the pulmonary veins (PVs). It is hypothesized that bursts of AT, or even PACs, may lead to atrial electrical remodeling, which in turn leads to persistent and, eventually, chronic AF.19 The current clinical experience with the ablation of paroxysmal AF points to a single or multiple triggering foci that initiate rapid runs of atrial tachycardia that may lead to AF. Additional support to the hypothesis that focal activity may be the cause of chronic AF is provided by another publication of the ablation of chronic AF in humans.20 In this report, linear lesions in the left atrium (LA) were directed at the regions of maximally fractionated electrical activity, resulting in termination of the AF and unmasking of focal AT originating from PV ostia, trabeculated portions of the atrium, and the LA appendage. However, it is also possible that the AT is an iatrogenic result of noncontiguous and/or non-transmural linear lesions. Presently, the predominant RF ablation catheters in use employ single or bidirectional deflection with several deflection lengths. However, it is common that ablation procedures are significantly prolonged, at times failing as the result of an inability to deliver effective RF energy to the appropriate arrhythmogenic tissues. Although magnetically guided technology may resolve the ability of the catheter tip to reach the targeted tissues, it is markedly more expensive than designing simple catheters that properly fit the intended anatomy. Myocardial tissue is irreversibly damaged at temperatures over 50°C. Deeper lesions are produced as the catheter tip–tissue interface temperature increases, until it reaches 100°C, at which point plasma boils, resulting in coagulum formation at the catheter tip. This can result in clot embolization, a sudden increase in impedance, loss of thermal conductivity, and/or ineffective tissue heating. In certain situations, excessive heating of the deep tissue layers can result in the production of steam within the tissue, ultimately leading to a “steam pop,” tissue disruption, and possible cardiac perforation. To prevent such events and to monitor lesion efficacy, RF ablation is generally performed in the temperature-control mode. An additional approach to define the ostial region of the PV as well as maintain tissue contact with the ablation catheter tip can be achieved with a simple modification of the current deflectable ablation catheters. The creation of a tight deflection of the distal shaft of the ablation catheter permits insertion of the shaft into a PV with the ablation tip protruding from the vein and deflected 90 degrees to create contact with the LA tissue. The shaft characteristics allow transmission of catheter-handle rotation to the ablation tip via long 11F pre-shaped sheaths designed to engage the PVs. By rotating the catheter handle, torque is transmitted to the ablating tip, which rotates around the orifice. The ablation tip is 8 mm, followed by a 2 mm ring electrode and an additional pair placed 5 mm from the distal electrodes for recording the electrical activity within the PV ostium. Using a long sheath, the catheter is delivered into the PVs across the atrial septum. The position of the ablation catheter tip is ascertained using contrast injection figure 2. This simple modification of the current ablation catheters can easily create circumferential lesions around the PVs and is effective and easy to use. It defines its anatomical position around the PVs and has the potential to reduce both ablation time and radiation exposure without decreasing efficacy of AF ablation and without increasing the current catheter cost. The ablation catheter is introduced into the PVs via a 9 F sheath. Once the tip of the catheter is in the PV, the sheath is withdrawn while maintaining the catheter position in the PV. As shown below, the spiral catheter expands within the vein and the coil electrodes are embedded within and under the orifice of the PV figure 4. The spiral catheter was tested in animals to assess the safety and efficacy of placing circumferential lesions around the PVs. 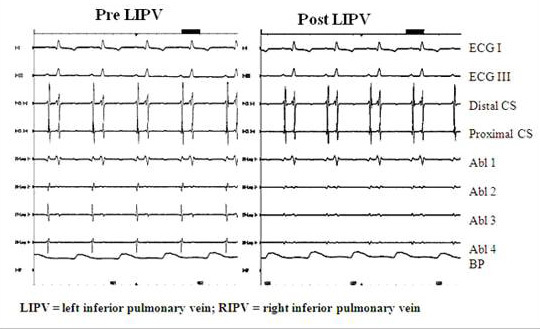 Lesion efficacy was assessed with pre- and post-ablation changes in pacing threshold, intra-PV electrogram amplitude measurements, PV angiography and intra-PV ultrasound. All of these measurements were taken pre/post ablation and during the final study following 2.5 months of recovery. RF energy was delivered in the temperature control mode and power was delivered to one electrode at the time. Pre-ablation pacing threshold and P-wave amplitude were measured on each electrode Figure 5. Intracardiac Echocardiography (ICE) was used to measure PV diameter before and immediately after ablation. Pulmonary angiography was performed in two perpendicular projections (LAO and RAO) before and after ablation, and during the final study. 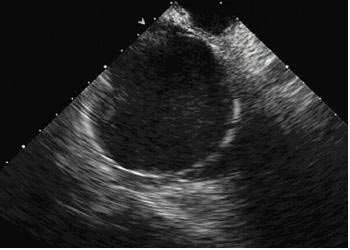 Transthoracic echocardiography (ECHO) and pulsed Doppler evaluation of left atrial (LA) size and mitral flow was performed before and one month after ablation. Detailed histological evaluation was then performed using H&E and trichrome staining . The average temperature reached was 72 ± 3.6°C. The average power to reach the desired temperature was 23.6 ± 5 Watts applied for 118 ± 8 sec. No perforations, pericardial or plural effusion, or hemorrhage occurred with the use of this technique. LA size, transmitral flow, and PV Doppler flow patterns did not change one month post-ablation. In 11/13 PVs the amplitude of the local electrograms was reduced by 40% (p<0.01), and the pacing threshold increased from 6.9 ± 3.1 mA to more than 10 mA (p<0.04). No visible PV narrowing was seen during final PV angiography. PV circumferential lesions were documented in PVs and no PV stenosis was documented post mortem. However, to create a circular PV isolation lesion the catheter has to be rotated to a different position to create a circumferential lesion. The most important determinant in the effective creation of a RF lesion is the electrode–tissue contact. Using the variable loop concept, the globular shaped atrial chambers will adapt around the catheter providing continuous contact. When using temperature control with this technology, over 90% of the lesions created in both atria were both contiguous and transmural; the incidence of impedance rises was minimized. The catheter can be used to create linear lesions 6 mm wide and up to 16 cm long with minimal manipulation. Linear lesions were made by ablating at individual electrodes. The time required to create an entire linear lesion could be greatly reduced by using a closed-loop system to simultaneously deliver RF power to multiple electrodes to maintain a set temperature. Having multiple ablation electrodes on a single shaft allows for minimal catheter manipulation in creating long linear lesions and, therefore, reduces both thromboembolic risk and radiation exposure. Once the catheter is in place, it remains in position for the duration of the power application to all of the electrodes. Initial efforts to assess the efficacy of this technology for the ablation of AF in humans has not resulted in a great success most likely related to the lack of PV isolation. Avitall et al demonstrated that new cryo balloon technology can safely and effectively electrically isolate the PVs in dogs . The cryo balloon catheter (Boston Scientific Corporation, Natick, MA, USA), shown in figure 14, creates cryo lesions by delivering liquid N2O into the semi compliant balloon (15-22 mm diameter).54 After multiple consecutive cryo lesions no PV stenosis was noted 3 months after ablation. After cryo ablation, PV electrograms was eliminated and tissue recovery exhibits no cartilage formation. Acute tissue hemorrhage and hemoptysis are short-term complications of cryo ablation. 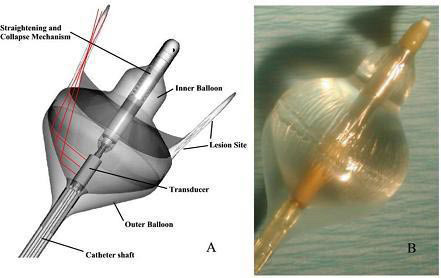 Further development of catheter designs, such as use of a larger turnip shaped balloon will allow for improved adaptation of the balloon to the human PVs. 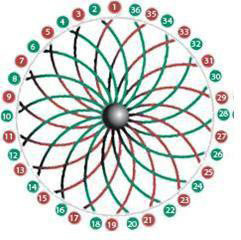 Whayne et al conducted a study to determine the effect of various microwave antenna designs, frequencies, and ablation times on the radial tissue temperature gradients and lesion size. These were compared to RF lesions of similar durations. The major findings of the study were that 915- and 2450-MHz microwave antennas had similar tissue temperature profiles and produced lesion sizes that were not significantly different figure 15. The time course of lesion formation with microwave ablation was significantly longer than that seen with radiofrequency ablation, but the microwave lesion continues to increase in size over a 600 sec of energy delivery while the RF lesion reaches steady state by 60 sec. Another study demonstrated that ablation depth can be predictably controlled by microwave energy power and ablation time, and that the temperature at the tissue surface remains below 100˚C over the time required to produce a 6 mm deep lesion, thus preventing endocardial charring, carbonization, cavitation, and disruption.58 Microwave ablation has been shown to be safe and efficient method and have potential advantages over radiofrequency ablation as shown in following table. Radiofrequency Ablation 1. Simple, well-proven technology. 2. Ability to assess contact. 3. Assessment of temperature. 4. Limited tissue damage. 1. Difficulty of uniform assessment of tissue contact. 2. Significant amount of collagenand cartilage/calcification. 3. Moderate risk of stroke, PV stenosis. 4. Atrial shrinkage. 5. Moderate reduction in atrial mechanical function. The amount of ultrasound energy transferred to the tissue is proportional to the intensity of the wave and absorption coefficient of the tissue. Due to this property, ultrasound ablation does not require direct contact with the myocardium, as compared to RF ablation. Ultrasound energy falls off proportionally with the distance (1/r) whereas RF ablation current density falls off 1/r4. This feature allows ultrasound energy to create deeper, transmural lesions. The ability of ultrasound to be collimated through a fluid medium makes it ideal for a balloon delivery system. 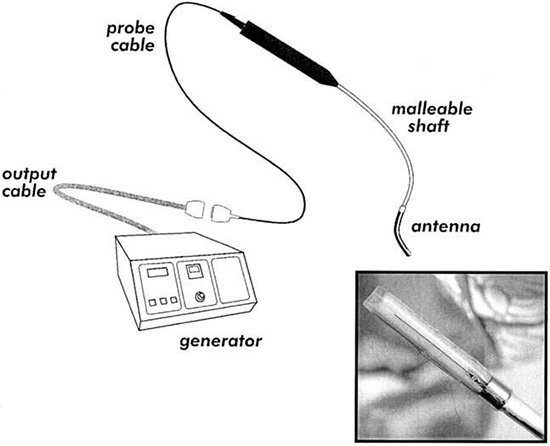 In this method, an ultrasound transducer is mounted on a catheter shaft within an expandable balloon. As a result, a balloon ultrasound ablation catheter system (Atrionix, Inc., Sunnyvale, CA, USA) delivered with an over-thewire technique has been developed for AF ablation.63 The system is advanced over a guidewire into the target pulmonary vein. Ablation system performance and tissue heating were monitored and confirmed by thermocouples on the balloon and the ultrasound transducer. A cylindrical ultrasound transducer is mounted axially near the distal end of the catheter, with a saline-filled compliant balloon that is inflated over the region of the transducer. An occlusive pulmonary venogram is taken to confirm the transducer position. Surprisingly, several applications were required to achieve isolation of the pulmonary veins (PVs). Overall, acute procedural success was achieved in only 73% with ultrasound balloon systems, and long-term cure was observed in about 30% of patients. During PV ablation, only 40% of the ostial lesions reached a temperature of >60°C in patients with recurrence of AF, compared with 64% of those who were free of recurrence. The variability of the PV anatomy was thought to be the main reason for system failure figure 16. In addition, the system delivered a narrow band of ultrasound energy radially from a centrally located transducer. This limitation in lesion po sitioning prevented the operators from including the antrum of the PVs in the lesion boundaries. 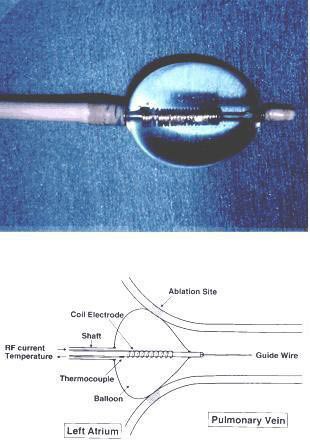 The HIFU (High Intensity Focused Ultrasound) technology was introduce in an effort to overcome some of the limitations presented with the initial design of the ultrasound ablation balloon. HIFU energy travels up to a distance of 10 mm through all layers of the left atrial wall. It is delivered in three sequential phases from endocardium to epicardium. During the first phase the energy ablates the subendocardial tissue. The second phase ablates myocardial tissue, and epicardium is ablated during the final phase. Light amplification by stimulated emission of radiation (laser) produces a monochromatic, phase coherent beam at a specific wavelength. This beam can be directed for a specific duration and intensity and as it penetrates into the tissue, after which it is absorbed and scattered. The photo-thermal effect occurs with the absorption of photon energy, producing a vibrational excited state in surrounding molecules. By absorbing this energy, the tissue is heated and a lesion is created. Laser energy can create deeper lesions with less reliance on thermal diffusion, and can reduce tissue vaporization and coagulum formation. Prior experimental studies have shown a significant linear correlation between the total delivered laser energy and the lesion dimension.69 With the use of low-power energy settings, no crater formation was noted, and lesion depth was more related to duration of application rather than the power of the application. 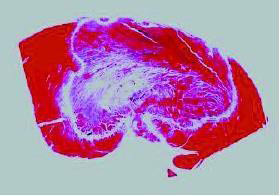 Histologically, laser lesions were homogeneous and sharply demarcated, without epicardial crater or endocardial thrombus formation. This indicates that the focused nature of the energy below the tissue-device interface minimizes the collateral atrial tissue damage that can compromise contractility and become arrhythmogenic substrate figure 19. A laser balloon has been developed to allow the delivery of circular beams of photonic energy to perform PV isolation without PV stenosis and with minimal endothelial disruption. Photonic energy is delivered through a fiberoptic balloon catheter with a 12 Fr collapsed profile Figure 20. 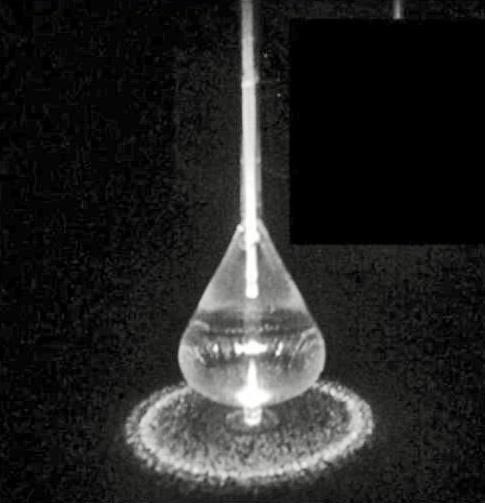 The light is transferred from the fiberoptic core using a modified glass fiber tip, through an optically transparent shaft into the balloon, and projected as a ring onto the distal balloon surface. The balloons used were 21 mm or 26 mm in diameter, and the projected ring had a maximum diameter of 17 mm and 22 mm, respectively. The balloon is filled with a 3ml mixture of contrast and D2O (Deuterium Dioxide). D2O is used to eliminate self-heating of the balloon by shifting the absorption to wavelengths longer than the 980 nm utilized. D2O has been used in humans and animals for measuring water spaces, and if inad vertent rupture of the balloon occurred, the small amount of D2O would not be expected to have any deleterious effects. 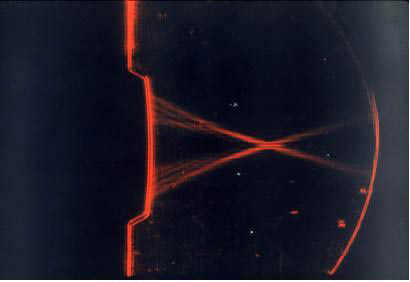 The intensity of the emitted light around the ring delivered to the tissue varies by less than 15% and is continuous with no gaps.72 A linear laser delivery may offer a number of potential advantages over conventional radiofrequency catheter ablation: (1) the laser diffuser is a single flexible and compliant fiber that can create thin lesions; (2) continuous intimate contact between the catheter and the endocardium may not be essential for delivery of laser energy; (3) the laser diffuser is Teflon coated and is not directly heated during energy delivery, and thus is not prone to char formation on the catheter; and (4) laser energy delivery is not subject to disruption by rises in impedance. Initial experience has shown that AF ablation in the RA is possible but with very low (13-42%) success rate. Greater success can be achieved with linear lesions in both atria in patients with paroxysmal AF, with reported success rates of over 62%1-4,73-81 No long-term success data is available for chronic AF. Most of the procedures have been done with the use of the catheter drag technique and its considerable complication rates. We have also learned that the current ablation technology is not suitable for the creation of transmural contiguous linear lesions, thus subjecting the patient to the prolonged procedures with considerable complication risk. The use of the loop catheter design and perhaps other designs of ablation technology specifically targeted for the creation of linear lesions should be developed if the catheter approach for the ablation of AF is to succeed. In this paper we have summarized the effort made to date in the development and testing of catheter-based systems and the development of methodologies for the effective ablation of AF in experimental models. However, the ablation of AF has been associated with mixed results and numerous complications. It is thought that patients with paroxysmal AF require PV isolation and those with persistent AF need more extensive ablation involving linear lesions. The concept of ablating the tissues exhibiting maximal fractionated activity and or those with the maximum dominant frequency has yet to yield consistent results. It remains to be seen if catheter-based AF ablation in the human atria provides long-term protection from AF. More importantly, incomplete lesions may introduce new substrate for reentrant arrhythmia by leaving gaps in ablation lines creating atrial tachycardia. The medical management of such arrhythmia may be significantly more difficult requiring additional ablation procedures. Thus, at this time the guiding light for the effective ablation of AF remains the Cox MAZE template. We believe that with an appropriate catheter ablation strategy targeting the complex LA anatomy, such as balloon ablation devices for PV isolation and expandable loop catheters to create linear connecting lesions, it may be possible to reproduce the MAZE-type atrial lesions. Kimura B J, BhargavaV, DeMariaA N. Value and limitations of intravascular ultrasound imaging in characterizing coronary atherosclerotic plaque. Am. Heart J. 1995;130 (2):386–96. Kannel W B, AbbottR D, SavageD D, McNamaraP M. Epidemiologic features of chronic atrial fibrillation: the Framingham study. N. Engl. J. Med. 1982;306 (17):1018–22. Krahn A D, ManfredaJ, TateR B, MathewsonF A, CuddyT E. The natural history of atrial fibrillation: incidence, risk factors, and prognosis in the Manitoba Follow-Up Study. Am. J. Med. 1995;98 (5):476–84. Podrid P J. Atrial fibrillation in the elderly. Cardiol Clin. 1999;17 (1):173–88, ix-x. Furberg C D, PsatyB M, ManolioT A, GardinJ M, SmithV E, RautaharjuP M. Prevalence of atrial fibrillation in elderly subjects (the Cardiovascular Health Study). Am. J. Cardiol. 1994;74 (3):236–41. Psaty B M, ManolioT A, KullerL H, KronmalR A, CushmanM, FriedL P, WhiteR, FurbergC D, RautaharjuP M. Incidence of and risk factors for atrial fibrillation in older adults. Circulation. 1997;96 (7):2455–61. Wolf P A, AbbottR D, KannelW B. Atrial fibrillation as an independent risk factor for stroke: the Framingham Study. Stroke. 1991;22 (8):983–8. Coplen S E, AntmanE M, BerlinJ A, HewittP, ChalmersT C. Efficacy and safety of quinidine therapy for maintenance of sinus rhythm after cardioversion. A meta-analysis of randomized control trials. Circulation. 1990;82 (4):1106–16. Flaker G C, BlackshearJ L, McBrideR, KronmalR A, HalperinJ L, HartR G. Antiarrhythmic drug therapy and cardiac mortality in atrial fibrillation. The Stroke Prevention in Atrial Fibrillation Investigators. J. Am. Coll. Cardiol. 1992;20 (3):527–32. Preliminary report: effect of encainide and flecainide on mortality in a randomized trial of arrhythmia suppression after myocardial infarction. The Cardiac Arrhythmia Suppression Trial (CAST) Investigators. N. Engl. J. Med. 1989;321 (6):406–12. Vrobel T R, MillerP E, MostowN D, RakitaL. A general overview of amiodarone toxicity: its prevention, detection, and management. Prog Cardiovasc Dis. 1989;31 (6):393–426. Sanoski C A, SchoenM D, GonzalezR C, AvitallB, BaumanJ L. Rationale, development, and clinical outcomes of a multidisciplinary amiodarone clinic. Pharmacotherapy. 1998;18 (6 Pt 2):146S–151S. Cox J L, CanavanT E, SchuesslerR B, CainM E, LindsayB D, StoneC, SmithP K, CorrP B, BoineauJ P. The surgical treatment of atrial fibrillation. II. Intraoperative electrophysiologic mapping and description of the electrophysiologic basis of atrial flutter and atrial fibrillation. J. Thorac. Cardiovasc. Surg. 1991;101 (3):406–26. 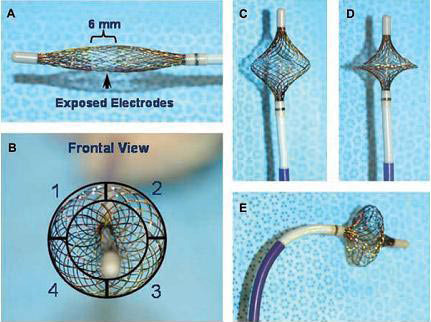 Cox J L. Evolving applications of the maze procedure for atrial fibrillation. Ann. Thorac. Surg. 1993;55 (3):578–80. Damiano Ralph J. 50th Anniversary Landmark Commentary on Cox JL, Boineau JP, Schuessler RB, Kater KM, Lappas DG. Five-Year Experience With the Maze Procedure for Atrial Fibrillation. Ann Thorac Surg 1993;56:814-24. Ann. Thorac. Surg. 2015;100 (5):–. Cox JL, BoineauJP, SchuesslerRB. Surgical interruption of atrial re-entry as a cure for atrial fibrillation. In: Olsson SB, Allessie MA, Campbell RWF, eds. Atrial fibrillation: mechanism and therapeutic strategies. Futura Publishing Co. Inc. Armonk, New York: Chapter. 1994;27:373–404. Cox J L, JaquissR D, SchuesslerR B, BoineauJ P. Modification of the maze procedure for atrial flutter and atrial fibrillation. II. Surgical technique of the maze III procedure. J. Thorac. Cardiovasc. Surg. 1995;110 (2):485–95. Cox J L, BoineauJ P, SchuesslerR B, FergusonT B, CainM E, LindsayB D, CorrP B, KaterK M, LappasD G. Operations for atrial fibrillation. Clin Cardiol. 1991;14 (10):827–34. Maloney J D, MilnerL, BaroldS, CzerskaB, MarkelM. Two-staged biatrial linear and focal ablation to restore sinus rhythm in patients with refractory chronic atrial fibrillation: procedure experience and follow-up beyond 1 year. Pacing Clin Electrophysiol. 1998;21 (11 Pt 2):2527–32. Nathan H, EliakimM. The junction between the left atrium and the pulmonary veins. An anatomic study of human hearts. Circulation. 1966;34 (3):412–22. CARROW R, CALHOUNM L. THE EXTENT OF CARDIAC MUSCLE IN THE GREAT VEINS OF THE DOG. Anat. Rec. 1964;150 ():249–56. Manolis A S, WangP J, EstesN A. Radiofrequency catheter ablation for cardiac tachyarrhythmias. Ann. Intern. Med. 1994;121 (6):452–61. Avitall Boaz, LafontaineDaniel, RozmusGrzegorz, AdoniNaveed, LeKhoi M, DehneeAbdelkader, UrbonasArvydas. The safety and efficacy of multiple consecutive cryo lesions in canine pulmonary veins-left atrial junction. Heart Rhythm. 2004;1 (2):203–9. Sabo D L, DurrantJ D, CurtinH, BostonJ R, RoodS. Correlations of neuroanatomical measures to auditory brain stem response latencies. Ear Hear. 1992;13 (4):213–22. Demazumder D, MirotznikM S, SchwartzmanD. Biophysics of radiofrequency ablation using an irrigated electrode. J Interv Card Electrophysiol. 2001;5 (4):377–89. Nakagawa H, YamanashiW S, PithaJ V, ArrudaM, WangX, OhtomoK, BeckmanK J, McClellandJ H, LazzaraR, JackmanW M. Comparison of in vivo tissue temperature profile and lesion geometry for radiofrequency ablation with a saline-irrigated electrode versus temperature control in a canine thigh muscle preparation. Circulation. 1995;91 (8):2264–73. 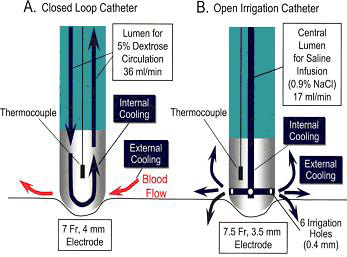 Yokoyama Katsuaki, NakagawaHiroshi, WittkampfFred H M, PithaJan V, LazzaraRalph, JackmanWarren M. Comparison of electrode cooling between internal and open irrigation in radiofrequency ablation lesion depth and incidence of thrombus and steam pop. Circulation. 2006;113 (1):11–9. Avitall B, UrbonieneD, KoblishJ, TaimistoM, UrbonasA. New Corkscrew Radiofrequency Catheter for the Segmental Isolation of the Pulmonary Veins. PACE. 2002;0:640–0. Avitall B, AleksonisD, KoblishJ, ChicosA, MykytseyA, TaimistoM. 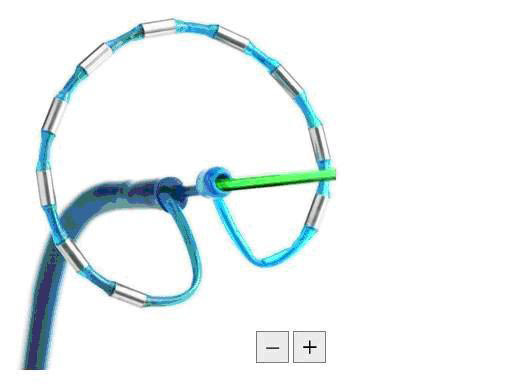 New RF J shaped catheter design for creation of circumferential linear lesions and PVs isolation. Heart Rhythm. 2005;0:0–0. Boersma Lucas V A, WijffelsMaurits C E F, OralHakan, WeverEric F D, MoradyFred. Pulmonary vein isolation by duty-cycled bipolar and unipolar radiofrequency energy with a multielectrode ablation catheter. Heart Rhythm. 2008;5 (12):1635–42. Wijffels Maurits C E F, Van OosterhoutMatthijs, BoersmaLucas V A, WernethRandy, KunisChris, HuBetty, BeekmanJet D M, VosMarc A. Characterization of in vitro and in vivo lesions made by a novel multichannel ablation generator and a circumlinear decapolar ablation catheter. J. Cardiovasc. Electrophysiol. 2009;20 (10):1142–8. Avitall B, HelmsR W, KoblishJ B, SiebenW, KotovA V, GuptaG N. The creation of linear contiguous lesions in the atria with an expandable loop catheter. J. Am. Coll. Cardiol. 1999;33 (4):972–84. Gauri Andre J, KnightBradley P. Catheter ablation for atrial fibrillation. Indian Pacing Electrophysiol J. 2003;3 (4):210–23. Avitall Boaz, UrbonasArvydas, UrbonieneDalia, RozmusGrzegorz, HelmsRay. Linear lesions provide protection from atrial fibrillation induction with rapid atrial pacing. J. Cardiovasc. Electrophysiol. 2002;13 (5):455–62. Arruda Mauricio S, HeDing Sheng, FriedmanPaul, NakagawaHiroshi, BruceCharles, AzegamiKoji, AndersRobert, KozelPeter, ChiavettaAmedeo, MaradPaul, MacAdamDavid, JackmanWarren, WilberDavid J. A novel mesh electrode catheter for mapping and radiofrequency delivery at the left atrium-pulmonary vein junction: a single-catheter approach to pulmonary vein antrum isolation. J. Cardiovasc. Electrophysiol. 2007;18 (2):206–11. Lewalter T, WilliamsC, LikfettL, MeissnerA, SteinwenderC, HofmanR, SteinerS, PoschmannU. 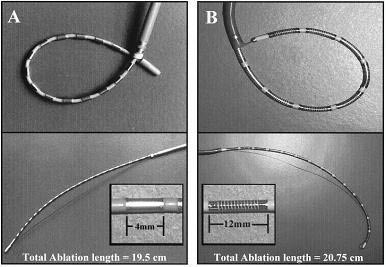 Combined Mapping and Ablation with a High Density Mesh Electrode Catheter for Atrial Fibrillation: Acute Catheter Performance from a German and Austrian Multicenter Evaluation. http:// www.bardep.com/pdf/lt04z0237a.pdf. 0;0:0–0. Tanaka K, SatakeS, SaitoS, TakahashiS, HiroeY, MiyashitaY, TanakaS, TanakaM, WatanabeY. A new radiofrequency thermal balloon catheter for pulmonary vein isolation. J. Am. Coll. Cardiol. 2001;38 (7):2079–86. Stobie Paul, GreenMartin S. Cryoablation for septal accessory pathways: has the next ice age arrived?. J. Cardiovasc. Electrophysiol. 2003;14 (8):830–1. Becker Ruediger, SchoelsWolfgang. Ablation of atrial fibrillation: energy sources and navigation tools: a review. J Electrocardiol. 2004;37 Suppl ():55–62. Arora PK, HansenJC, LatchamsettyR, AvitallB. Is Cryo a better energy source than radiofrequency for AF ablation in preventing esophageal injury?. J Atrial Fibrillation. 2009;0:321–327. Harrison L, GallagherJ J, KasellJ, AndersonR H, MikatE, HackelD B, WallaceA G. Cryosurgical ablation of the A-V node-His bundle: a new method for producing A-V block. Circulation. 1977;55 (3):463–70. Lustgarten D L, KeaneD, RuskinJ. Cryothermal ablation: mechanism of tissue injury and current experience in the treatment of tachyarrhythmias. Prog Cardiovasc Dis. 1999;41 (6):481–98. Papez Andrew L, Al-AhdabMohamad, DickMacdonald, FischbachPeter S. Transcatheter cryotherapy for the treatment of supraventricular tachyarrhythmias in children: a single center experience. J Interv Card Electrophysiol. 2006;15 (3):191–6. Klein G J, GuiraudonG M, PerkinsD G, SharmaA D, JonesD L. Controlled cryothermal injury to the AV node: feasibility for AV nodal modification. Pacing Clin Electrophysiol. 1985;8 (5):630–8. Cox J L, AdN. The importance of cryoablation of the coronary sinus during the Maze procedure. Semin. Thorac. Cardiovasc. Surg. 2000;12 (1):20–4. Gaita Fiorenzo, RiccardiRiccardo, CaponiDomenico, ShahDipen, GarberoglioLucia, VivaldaLaura, DulioAlessandro, ChiecchioAndrea, ManasseEric, GallottiRoberto. Linear cryoablation of the left atrium versus pulmonary vein cryoisolation in patients with permanent atrial fibrillation and valvular heart disease: correlation of electroanatomic mapping and long-term clinical results. Circulation. 2005;111 (2):136–42. Skanes A C, DubucM, KleinG J, ThibaultB, KrahnA D, YeeR, RoyD, GuerraP, TalajicM. Cryothermal ablation of the slow pathway for the elimination of atrioventricular nodal reentrant tachycardia. Circulation. 2000;102 (23):2856–60. Rodriguez Luz-Maria, GellerJ Christoph, TseHung-Fat, TimmermansCarl, ReekSven, LeeKathy Lai-fun, AyersGregory M, LauChu-Pak, KleinHelmut U, CrijnsHarry J G M. Acute results of transvenous cryoablation of supraventricular tachycardia (atrial fibrillation, atrial flutter, Wolff-Parkinson-White syndrome, atrioventricular nodal reentry tachycardia). J. Cardiovasc. Electrophysiol. 2002;13 (11):1082–9. Tse Hung-Fat, ReekSven, TimmermansCarl, LeeKathy Lai-Fun, GellerJ Christoph, RodriguezLuz-Maria, GhayeBenoit, AyersGregory M, CrijnsHarry J G M, KleinHelmut U, LauChu-Pak. Pulmonary vein isolation using transvenous catheter cryoablation for treatment of atrial fibrillation without risk of pulmonary vein stenosis. J. Am. Coll. Cardiol. 2003;42 (4):752–8. Skanes Allan C, JensenSteen M, PappRobert, LiJuliana, YeeRaymond, KrahnAndrew D, KleinGeorge J. 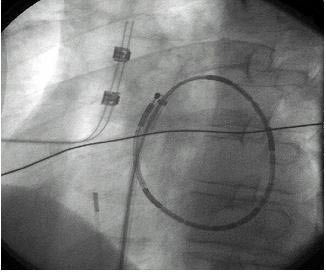 Isolation of pulmonary veins using a transvenous curvilinear cryoablation catheter: feasibility, initial experience, and analysis of recurrences. J. Cardiovasc. Electrophysiol. 2005;16 (12):1304–8. Avitall Boaz, UrbonieneDalia, RozmusGrzegorz, LafontaineDan, HelmsRay, UrbonasArvydas. New cryotechnology for electrical isolation of the pulmonary veins. J. Cardiovasc. Electrophysiol. 2003;14 (3):281–6. Johnson CC, GuyAW. Nonionizing electromagnetic wave effects in biological materials and systems. Proc IEEE. 1972;60:692–709. de Gouveia Rosa Henriques, MeloJoão, SantiagoTeresa, MartinsAna Paula. Comparison of the healing mechanisms of myocardial lesions induced by dry radiofrequency and microwave epicardial ablation. Pacing Clin Electrophysiol. 2006;29 (3):278–82. Williams Mathew R, KnautMichael, BérubéDany, OzMehmet C. Application of microwave energy in cardiac tissue ablation: from in vitro analyses to clinical use. Ann. Thorac. Surg. 2002;74 (5):1500–5. Whayne J G, NathS, HainesD E. Microwave catheter ablation of myocardium in vitro. Assessment of the characteristics of tissue heating and injury. Circulation. 1994;89 (5):2390–5. Yiu KH, LauCP, LeeK, TseHF. Emerging energy sources for catheter ablation of atrial fibrillation. J Cardiovasc Electrophysiol. 2006;17:0–61. Bethesda MD. National Council on Radiation Protection: Biological effects of ultrasound: Mechanisms and clinical implications. NCRP Report. 1983;0:0–0. Gentry Kenneth L, SmithStephen W. Integrated catheter for 3-D intracardiac echocardiography and ultrasound ablation. IEEE Trans Ultrason Ferroelectr Freq Control. 2004;51 (7):800–8. He D S, ZimmerJ E, HynynenK, MarcusF I, CarusoA C, LampeL F, AguirreM L. Application of ultrasound energy for intracardiac ablation of arrhythmias. Eur. Heart J. 1995;16 (7):961–6. Natale A, PisanoE, ShewchikJ, BashD, FanelliR, PotenzaD, SantarelliP, SchweikertR, WhiteR, SalibaW, KanagaratnamL, TchouP, LeshM. First human experience with pulmonary vein isolation using a through-the-balloon circumferential ultrasound ablation system for recurrent atrial fibrillation. Circulation. 2000;102 (16):1879–82. Saliba Walid, WilberDavid, PackerDouglas, MarroucheNassir, SchweikertRobert, PisanoEnnio, ShewchikJeannie, BashDianna, FanelliRaffaele, PotenzaDomenico, SantarelliPietro, TchouPatrick, NataleAndrea. Circumferential ultrasound ablation for pulmonary vein isolation: analysis of acute and chronic failures. J. Cardiovasc. Electrophysiol. 2002;13 (10):957–61. Ninet Jean, RoquesXavier, SeitelbergerRainald, DevilleClaude, PomarJose Luis, RobinJacques, JegadenOlivier, WellensFrancis, WolnerErnst, VedrinneCatherine, GottardiRoman, OrritJavier, BillesMarc-Alain, HoffmannDrew A, CoxJames L, ChampsaurGerard L. Surgical ablation of atrial fibrillation with off-pump, epicardial, high-intensity focused ultrasound: results of a multicenter trial. J. Thorac. Cardiovasc. Surg. 2005;130 (3):803–9. Meininger Glenn R, CalkinsHugh, LickfettLars, LopathPatrick, FjieldTodd, PachecoRobert, HarhenPaul, RodriguezE Rene, BergerRonald, HalperinHenry, SolomonStephen B. Initial experience with a novel focused ultrasound ablation system for ring ablation outside the pulmonary vein. J Interv Card Electrophysiol. 2003;8 (2):141–8. Cox JL. Contemporary options in the treatment of atrial fibrillation. In press. Medscape. 2005;0:0–0. 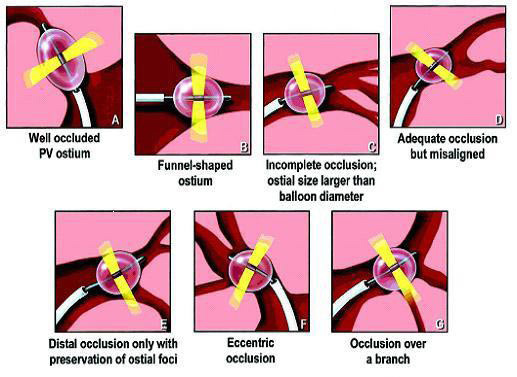 Surgical management of atrial fibrillation. Medscape. 2005. Available at:. http://www.medscape.com/viewarticle/ 503894. 2005;0:0–0. Littmann L, SvensonR H, ChuangC H, SplinterR, KemplerP, NortonH J, TuntelderJ R, ThompsonM, TatsisG P. Neodymium:YAG contact laser photocoagulation of the in vivo canine epicardium: dosimetry, effects of various lasing modes, and histology. Lasers Surg Med. 1993;13 (2):158–67. Fried N M, LardoA C, BergerR D, CalkinsH, HalperinH R. Linear lesions in myocardium created by Nd:YAG laser using diffusing optical fibers: in vitro and in vivo results. Lasers Surg Med. 2000;27 (4):295–304. Reddy Vivek Y, HoughtalingChristopher, FallonJay, FischerGwen, FarrNorm, ClarkeJamie, McIntyreJon, SinofskyEd, RuskinJeremy N, KeaneDavid. Use of a diode laser balloon ablation catheter to generate circumferential pulmonary venous lesions in an open-thoracotomy caprine model. Pacing Clin Electrophysiol. 2004;27 (1):52–7. 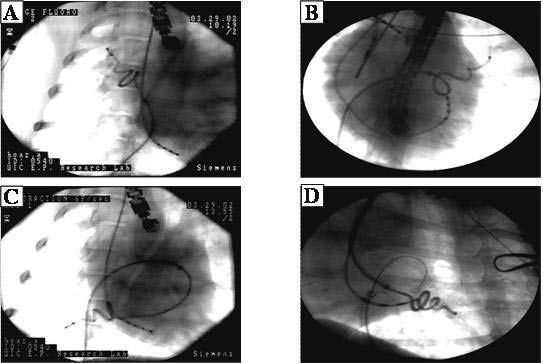 Keane D, RuskinJ N. Linear atrial ablation with a diode laser and fiberoptic catheter. Circulation. 1999;100 (14):e59–60. Haïssaguerre M, GencelL, FischerB, Le MétayerP, PoquetF, MarcusF I, ClémentyJ. Successful catheter ablation of atrial fibrillation. J. Cardiovasc. Electrophysiol. 1994;5 (12):1045–52. North American Society of Pacing and Electrophysiology 17th annual scientific sessions. Seattle, Washington, May 15-18, 1996. Abstracts. Pacing Clin Electrophysiol. 1996;19 (4 Pt 2):527–745. Haines DE, LangbergJJ, LeshMD, LeonAR. Catheter ablation of atrial fibrillation using the multiple electrode catheter ablation (MECA) system: preliminary clinical results. (abstract) ; :. PACE. 1998;0:832–832. Kuck KH, ErnstS, KhanedaniA, BraunE. Clinical follow up after primary catheter based ablation of atrial fibrillation using the CARTO system. (abstract) ; :. PACE. 1998;0:868–868. Jaïs P, HaïssaguerreM, ShahD C, ChouairiS, GencelL, HociniM, ClémentyJ. A focal source of atrial fibrillation treated by discrete radiofrequency ablation. Circulation. 1997;95 (3):572–6. Garg A, FinneranW, MollerusM, Birgersdotter-GreenU, FujimuraO, ToneL, FeldG K. Right atrial compartmentalization using radiofrequency catheter ablation for management of patients with refractory atrial fibrillation. J. Cardiovasc. Electrophysiol. 1999;10 (6):763–71. Hwang C, KaragueuzianH S, ChenP S. Idiopathic paroxysmal atrial fibrillation induced by a focal discharge mechanism in the left superior pulmonary vein: possible roles of the ligament of Marshall. J. Cardiovasc. Electrophysiol. 1999;10 (5):636–48. Chen S A, TaiC T, YuW C, ChenY J, TsaiC F, HsiehM H, ChenC C, PrakashV S, DingY A, ChangM S. Right atrial focal atrial fibrillation: electrophysiologic characteristics and radiofrequency catheter ablation. J. Cardiovasc. Electrophysiol. 1999;10 (3):328–35. Feld G K, FleckR P, FujimuraO, ProthroD L, BahnsonT D, IbarraM. 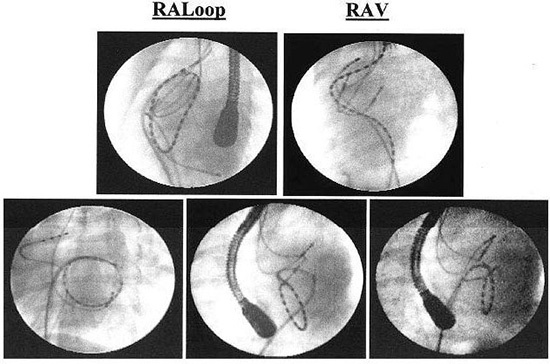 Control of rapid ventricular response by radiofrequency catheter modification of the atrioventricular node in patients with medically refractory atrial fibrillation. Circulation. 1994;90 (5):2299–307.